Born July 25, 1977, in Atlanta, Georgia. His Full name is Kenneth Cornelius Thomas, son of Calvin and Patricia. Kenny Thomas attended the University of New Mexico in Albuquerque, one of the highest-profile recruits to ever attend the school. He is second on the Lobos’ all-time scoring list (1,931 points), career blocks list (239), and career dunks list (114), and leads the school’s lists in career rebounds (1,032), freshman scoring (484) and rebounding (256), and personal fouls for a season (118) and career (383). Thomas is one of five Lobos to be selected as an All-American (1998). A four-year starter who led New Mexico to its best 4-year record in school history: UNM was 102-30 between 1995-99 with four successive trips – 8 games – to the NCAA Tournament…the Lobos won the WAC Tournament title Thomas freshman year (1996) and advanced to the championship game on two other occasions (1998 and 99)…head coach Dave Bliss said Thomas was the best big man he coached from a defensive and passing standpoint…became the 1st player in WAC history to log 1,800 points, 1,000 rebounds and 200 blocks…played in 123 games with 119 starts…34 career double-doubles, 10 his senior year…a member of the U.S. team that won the gold medal at the 1997 World University Games in Trapani, Italy. Career Honors The only Lobo to earn All-Western Athletic Conference honors three times (1996, 1998-99)…2nd team All-America by Basketball Times following his junior season…honorable mention All-America by the Associated Press in 1998 and 99…two-time Most Valuable Player of the WAC Tournament (1996 and 98)…finalist for the Naismith Player of the Year Award and the John Wooden Award in 1998 and 99…3rd Team Freshman All-America by Basketball Times and WAC Freshman of the Year in 1996. The Houston Rockets selected Thomas as the 22nd pick in the 1999 NBA Draft. 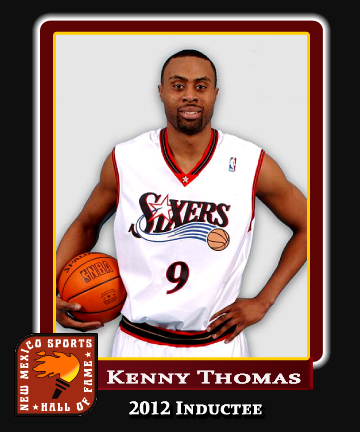 Kenny enjoyed a stellar career before retiring from basketball in 2010. After a successful NBA career, Mr. Thomas has transitioned from the basketball court to the boardroom. Kenny Thomas is President and CEO of Kenny Thomas Enterprises a dynamic and versatile multi faceted conglomerate. KTE encompasses television and film production, sports entertainment and management and real estate development and merchandising. KTE under the leadership of CEO Kenny Thomas is unveiling their new corporate logo in New Mexico and the surrounding Albuquerque area. The new logo in shades of gray and blue with its contemporary block K and outward encompassing distinctive letter T helps signify the ongoing evolution of the KTE brand. The new brand imaging is fresh and contemporary while being distinctive and memorable. “ I am excited about our new logo design and the endless possibilities to brand KTE utilizing the new logo as our brand ambassador”. Our new design is memorable and timeless as we continue to evolve and expand our distinguished and diversified identity” stated Kenny Thomas. The unveiling of the distinctive logo is in conjunction with Kenny Thomas Enterprises expanding into the Sacramento area after a successful run in the New Mexico market. “ The Sacramento and Northern California expansion of KTE is a natural fit for us. I have a home and family here and I want to be a part of the community that makes a difference” Said Thomas. Future endeavors for the Sacramento market include a charity golf tournament in the fall to help benefit disadvantaged youth and local charities. The television and film production entity of KTE is currently in the early production stages of their first film venture with details of a feature film to be announced this summer. In Albuquerque, New Mexico KTE successfully launched Infinity 02 its own bottled water (www.Infinity02.com) in New Mexico Supermarkets. KTE is looking to expand the market for Infinity 02 in the Sacramento and Northern California region. KTE is also interested in entering the local real estate development sector in the near future.